Three delicious flavors..available now at Lichtmans. March 1st surprise! Limited release Crown Royal Peach. It will disappear quickly! New item alert! Barefoot 3 liter box! Cabernet, Chardonnay, Moscato, Pinot Grigio, Pinot Noir and Rose! Looking for the right wine for your meal? Visit our wine and food pairings page here for some suggestions. 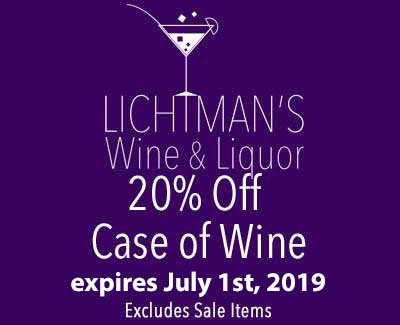 Lichtmans Wine & Liquor is located in Utica, New York. We offer a wide variety of delicious wines and liquors — you can be certain that you will find something you like! Lichtmans is a proud sponsor of our Local Utica Brewers Baseball Team and our Utica Yard Dawgs Football team!! Come visit us or contact us at (315) 732-8915 for more information! ©2019 Lichtmans Wine & Liquor, all rights reserved.